Its Sabroso Saturday (translation: Tasty Saturday) where many of us get together and link our recipes on Ms. Latina’s website – Latina On A Mission. Join the blog hop! Today I share with you my bistec empanizado recipe. My husband loves it and even though I do not partake in it, I do make it as healthy as I can. 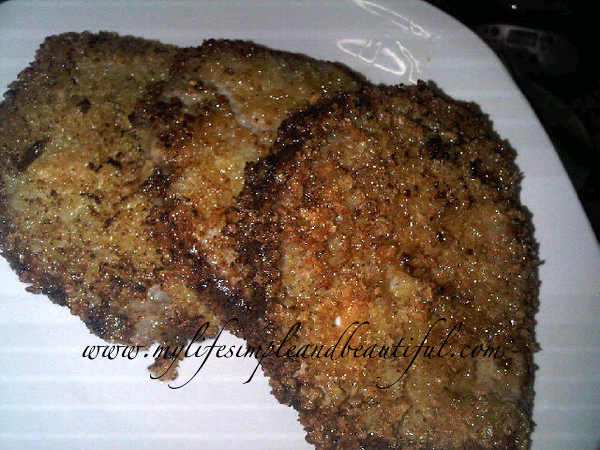 I fry the steaks in sesame oil as it is a healthier oil to cook with. I also use panko breadcrumbs because they are custom baked to an airy crisp and won’t burn as easily. Serves 4. I might also add a little soy sauce to the finished product for extra flavor. 1. Marinate the steaks in a little water and the vinegar. 3. Season steaks with Montreal Steal Seasoning, sazon, and garlic. Rub into the meat. 5. Dip the steaks in egg to cover both sides of steak then place in bread crumbs and cover both sides of steak completely. Repeat this step for all steaks. 6. Heat oil in skillet pan on medium high heat until hot. 7. Place steaks in pan and let fry on each side for about 4 minutes or until golden brown. 8. Remove steaks from pan and set on top of a cookie sheet that is underlined with paper towel to catch all excess oil. By placing them directly on a paper towel will make them soggy. Serve with tostones, rice and beans or salad. « Daisy’s Holiday Cookbook Is Out In Stores!